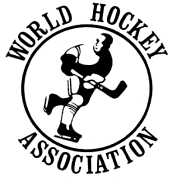 The World Hockey Association (French: Association mondiale de hockey) was a professional ice hockey league that operated in North America from 1972 to 1979. It was the first major competition for the National Hockey League (NHL) since the end of the Western Hockey League after the 1925-26 WHL season. Although the WHA was not the first league since that time to attempt to challenge the NHL's hold as the top league, it was by far the most successful. Teams in bold were absorbed into the NHL. Every season of the World Hockey Association had an All-Star game, but the format had changed with regularity. 1972-73 Eastern Division vs Western Division contest. 1973-74 Eastern Division vs Western Division contest. 1974-75 Eastern Division vs Western Division contest. 1975-76 Canadian-based teams (5) vs US-based teams (9). 1977-78 AVCO Cup champion (Quebec Nordiques) vs WHA All-Star team. 1978-79 WHA All-Star team vs Dynamo Moscow in a three game series. World Hockey Association Facts for Kids. Kiddle Encyclopedia.